The heat this season is intense and I find myself reaching out frequently for the bottle of water that I keep close at hand. There is however only so much water that one can drink. I’ve stopped taking aerated drinks and juice except for the occasional smoothie or juice that I whip up at home. The solution? A batch of naturally flavoured water, made in minutes from the fruit and veggies I had picked up at the grocery store. I really can’t think why I haven’t done this earlier. 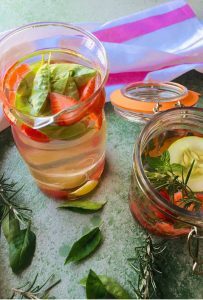 The naturally flavoured water, infused with cucumber or lemon or oranges, with a handful of herbs from the garden, help quench my thirst without making me yearn for a chilled bottle of ready made juice with all the sugar that would entail. And its so easy to make too. I have given a few combinations here, but you could work out your own favourite flavours. You will find family including kids drinking more water, and changing the flavours every day or so keeps things exciting. 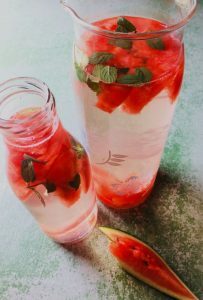 The easy flavoured water hardly needs a recipe, but I’m giving one in the recipe card below, to help decide the proportions of fruit and water, and some of the easiest (and tastiest) combinations. I will add more varieties here, as I make them. The fruit should be cut in fairly large slices but small enough to easily go into the neck of the bottle you plan to use. Wash the fruit really well as in most cases you will not be peeling them, and you want to avoid bacteria getting into your drinking water. Buying organic from a reputed source would certainly help. Most fruits can be used. 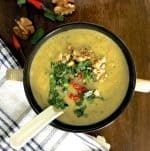 In fact I can’t think of many that I just would not use, except jack fruit maybe, and grapes (one would give overpowering flavour and the other, very little). Select fresh fruit that is in season, so that you get the maximum flavour out of them. 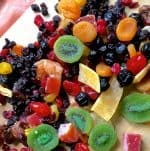 Frozen fruits can be used too, as they would be flavourful. I haven’t tried this but I think water infused with frozen fruit should not be replenished or used beyond two days. If you are buying herbs and don’t want to buy too much, pick on something like mint which goes with most fruit. 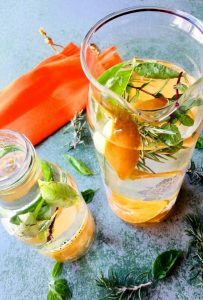 If like me, you are lucky enough to have different herbs in your garden, you can add more variety to your naturally flavoured water. You don’t need to go overboard – keep it simple. One or a maximum of two types of herbs are sufficient to perk up the water. Remember that the main ‘ingredient’ here is the water. 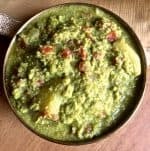 The fruit and herbs should be added in small quantities and not fill up the bottle. Of course, the more fruit you use, the higher in flavour the water will be. Its a matter of personal choice. The naturally flavoured water takes time to get infused with the flavours of the fruit and herbs. At least 2 hours or longer, and ideally in the fridge. If like me, you are not able to take ice cold water, just first chill the water while the flavours get infused, and then keep it out till it reaches room temperature. Or don’t chill it at all. Ive been drinking it like this all day and the water still tastes great! You can refill the bottles once or twice more, with the same fruit, which would have a lower intensity and less flavour each time, but still taste pleasant. Remove the fruits and herbs after 2 days so that they do not begin to decompose and cause health risks. The fruit left over after the water has been used, would have lost most of its flavour and may be used in compost if you don’t want to just throw it away. I have read recently that after the first day the fruit may be used in smoothies. I have not tried this yet but it would be great not to have to just discard the fruit. One irritant in pouring the naturally flavoured water is the fruit or herbs falling into the glass, and coming in the way of drinking the water. 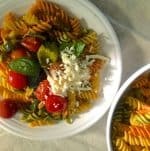 Try using large slices of fruit and sprigs of herbs. If the bottle or jar in which the water is kept has a spout and a close fitting lid, that should serve to keep the herbs and fruit in the jar while pouring into a glass. A water dispenser should also serve the same purpose but perhaps the fruit would clog the spigot? Possible. I have been pouring from jars with lids and a spout and have had no problems. Health Benefits: Drinking adequate water and keeping oneself hydrated has great health benefits as well as keeping complexion clear. Whether naturally flavoured waters or detox waters give more benefits than plain water? Read this article to find out! Flavoured water does give one advantage though – it makes is much easier to drink water through the day and give the body the hydration it requires, specially in intense hot weather like the one we are presently having. It reduces the need to drink sugared or carbonated waters. Just Citrus: Oranges and Lemons: Orange peel, quartered slices of lemon and a round slice of orange. 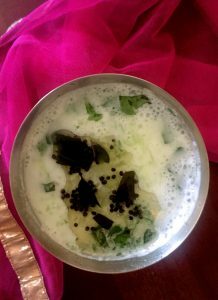 A sprig of rosemary and half a dozen basil leaves add to the flavours of this refreshing drink. Citrus, Cucumber and Mint: The smaller jar has a round slice of Orange, two quartered slices of Lemon (with a little squeeze of lemon juice), a slice of Cucumber. A few leaves of Basil and 2 sprigs of mint. Dice watermelon into small cubes. Remove seeds and any white pith remaining. Add to a jar. Add mint leaves and a sprig of mint after gently crushing them. Fill the jar with water. Chill and drink after an hour. More combinations coming up soon, with pomegranate and with Indian spices. 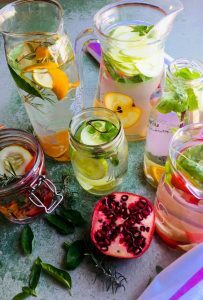 Detox and Chill with easy homemade naturally flavoured water. 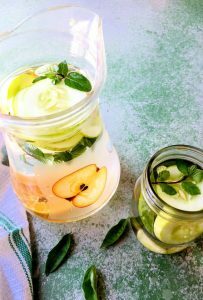 Fruit and herbs in various combinations that make drinking water a real pleasure. 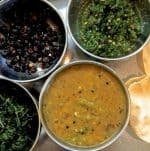 Wash the fruit and herbs thoroughly. Organic is best for making naturally flavoured water. Slice the fruit according to the neck of the bottle or jar being used. Watermelon: Dice into small cubes, about 1" square, or into long narrow wedges Orange: Slice into thin rounds, keeping the peel on. Some may be again sliced into two. Or remove some of the peel to add to the water. Take the slices and make a thin cut on each, to allow the flavour to readily go into the water. Some people have intolerance to orange or lemon peel so, be cautious. Lemon, Lime: Slice into quarters or eights. Strawberries: Hull (remove the top with the sepals and leaves). Slice into 2 or 4 Cucumber: Slice of each end and rub the piece hard against the cut end, so that the bitterness comes out. Slice into thin rounds (1/2 cm thick) Pomegranate: Cut and remove the aerils. Remove any white pith that you find among the aerils. 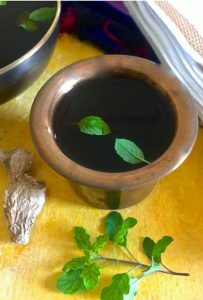 Herbs: Mint and Rosemary - keep as sprigs ( a small length, about 2", with the stems and leaves intact) Basil - Pluck the leaves alone and discard stems. Place the sliced fruit of your choice in the bottle. When using lemon slices, squeeze a few drops of the juice into the bottle and then add the slices in. Pour water till the jar is full. Crush the herbs gently (don't squeeze them, just scrunch them a little) and add. Using a wooden spoon or muddler, gently press the fruit or cucumber so that it releases flavour into the water. Close the bottle and chill for at least 2 hours. The longer you let it sit, the more the flavours that get infused into the water. One other way to fill up the bottle is by adding the fruit and herbs, then filling the bottle with ice cubes and pouring water over the ice until full. 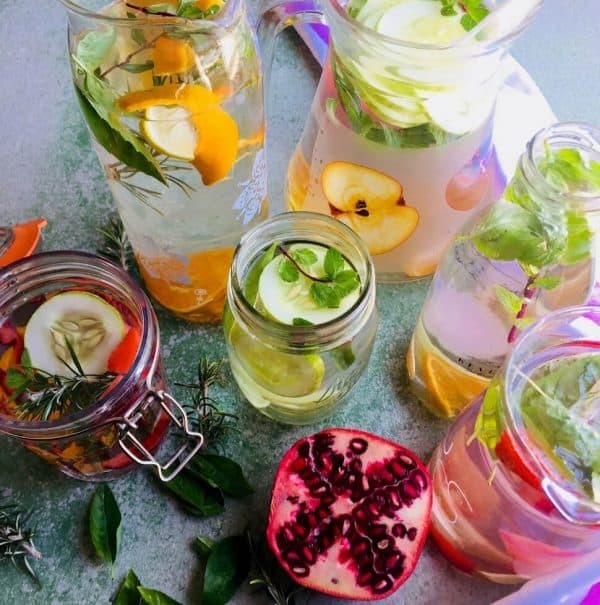 Love all the refreshing colors and the flavours of the fruit infused water.. very well explained post in all the detailed eight from ingredients to storing to the health benefits!! Thank you Swaty! Unprecedented heat this March at Bangalore and in many parts of India is making this my regular intake!